Neurosteroid modulation of GABAA receptors has been observed with all subunit combinations investigated; however, hetero-oligomeric GABAA receptors containing δ subunits were not studied previously. We describe the effect of δ subunit expression on 3α,21-dihydroxy-5α-pregnan-20-1 (THDOC)-induced potentiation of GABA-gated currents in transfected HEK 293 cells and in cerebellar granule cells in vitro. THDOC (100 nm) significantly potentiated GABA-gated currents in cells transfected with combinations of α1, α6, β3, and γ2 subunit cDNAs, whereas cotransfection of δ subunit cDNA inhibited this potentiation. In contrast, the direct Cl− channel activation by THDOC at higher concentrations (1–10 μm) was not significantly dependent on δ subunit cotransfection. These results suggest that the presence of the δ subunit inhibits GABAA receptor modulation but not the direct activation by neurosteroids. Cotransfection with δ subunit also affected the negative allosteric modulation by pregnenolone sulfate. THDOC potentiation of GABA-gated currents was greater in cerebellar granule cell cultures at 4 d in vitro(DIV) compared with those at 14 DIV. Single-cell reverse transcription-PCR analysis of the mRNAs expressed in cultured cerebellar granule cells shows that an increased number of granule cells at 14 DIV express δ subunit mRNAs as compared with 4 DIV granule cells. The presence of δ subunit mRNAs detected in individual cells correlated well with the lack of sensitivity to THDOC. These results suggest that developmental expression of GABAAreceptor δ subunits may play an important role in determining the region-specific neurosteroid-induced modification of fast inhibitory synaptic function. Ionotropic GABA receptors (GABAA) are heteropolymeric proteins that contain an integral ion channel and account for the majority of fast inhibitory synaptic transmission in the mammalian CNS (MacDonald and Olsen, 1994; Luddens et al., 1995). GABA-mediated activation of the GABAA receptor channel complex is modulated by various clinically important drugs acting on allosteric modulatory sites (MacDonald and Olsen, 1994; Luddens et al., 1995). Neurosteroids, which may be synthesized in glial cells, allosterically modulate GABA-activated Cl− channels (Majewska et al., 1986; for review, see Lambert et al., 1995). At a high concentration, neuroactive steroids directly activate the GABAA receptor channels, showing the same property as barbiturates (Lambert et al., 1995). Several studies have suggested that steroid-induced allosteric modulation requires a specific steroid binding domain on the GABAA receptor channel complex separate from those for benzodiazepines and barbiturates (Gee et al., 1988; Turner et al., 1989). In different neuronal populations, distinct neurosteroids have specific binding characteristics and may act as positive or negative modulators of GABAA receptor function (Majewska et al., 1986, 1988; Gee et al., 1988; Puia et al., 1990,1993; Gee and Lan, 1991; Lan et al., 1991; Shingai et al., 1991; Sapp et al., 1992; Korpi and Luddens, 1993). Molecular biological studies have shown that the GABAAreceptor channel complex is a pentameric structure of α, β, γ, and/or δ subunits with unknown stoichiometry and subunit composition (MacDonald and Olsen, 1994; Luddens et al., 1995; Whiting et al., 1995;Yeh and Grigorenko, 1995). The heterogeneous expression of GABAA receptor subunits confers specific physiological and pharmacological characteristics of native and recombinant GABAA receptors (Pritchett et al., 1989; Sigel et al., 1990; Mathews et al., 1994; Saxena and MacDonald, 1994, 1996; Ducic et al., 1995; Zheng et al., 1995). Although there is no absolute subunit specificity for neurosteroid modulation of GABAA receptors, it was demonstrated that subunit composition affects their actions, especially those of the α and γ subunits (Puia et al., 1990, 1993;Gee and Lan, 1991; Lan et al., 1991; Shingai et al., 1991; Sapp et al., 1992; Korpi and Luddens, 1993). A tissue-selective expression of GABAA receptor subunits and the assembly of GABAA receptors may account for the heterogeneity of neurosteroid modulation; for example, the greater potentiation of neurosteroids in the spinal cord has been attributed to region-specific expression of α3 subunit (Lan et al., 1991; Lambert et al., 1995). The influence of δ subunits on steroid modulation is currently unknown. This subunit is expressed mainly in cerebellum, thalamus, and hippocampus, and it is developmentally regulated (Bovolin et al., 1991;Laurie et al., 1992a,b; Fritschy et al., 1994; Fritschy and Mohler, 1995; Quirk et al., 1995; Zheng et al., 1995; Behringer et al., 1996). To address the role of the δ subunit expression in neurosteroid modulation, we used patch-clamp recordings to investigate neurosteroid allosteric modulation on GABA-gated currents in mammalian cells transiently transfected with recombinant GABAA receptors. We also determined δ subunit expression in cerebellar granule neurons at distinct developmental days in culture by the single-cell reverse transcription (RT)-PCR technique to correlate the presence of δ subunit mRNA with neurosteroid-induced modulation. Primary cell cultures. Primary cultures of rat cerebellar granule neurons were prepared from 8-d-old Sprague Dawley rat cerebella. Cells were dispersed with trypsin (0.25 mg/ml) (Sigma, St Louis, MO) and plated at a density of 0.8–1.0 × 106 on 35 mm Nunc dishes coated with poly-l-lysine (1%) (Sigma). Cells were cultured in BME (Life Technologies, Grand Island, NY) supplemented with 10% bovine calf serum, 2 mm glutamine, and 100 μg/ml gentamycin (Life Technologies), and were maintained at 37°C in 6% CO2. Cytosine arabinoside (10 μm) was added to all cultures 18–24 hr after plating to inhibit glial proliferation. The final concentration of KCl in the culture medium was adjusted to 25 mm. Human embryonic kidney (HEK) 293 cell line. HEK 293 cells (American Type Culture Collection, Rockville, MD; ATCC No. CRL1573) were grown in MEM (Life Technologies) supplemented with 10% fetal bovine serum, 100 U/ml penicillin (Life Technologies), and 100 U/ml streptomycin (Life Technologies), in a 6% CO2 incubator. Exponentially growing cells were dispersed with trypsin, seeded at 2 × 105 cells/35 mm dish in 1.5 ml of culture medium, and plated on 12 mm glass coverslips (Fisher Scientific, Pittsburgh, PA). cDNA transient transfection. Rat α1, β3, γ2S, and δ GABAA receptor subunit cDNAs individually subcloned into the expression vector pCDM8 (Invitrogen, San Diego, CA) and the α6 subunit cloned into the pCIS2 expression vector were provided by Dr. Peter Seeburg (Center for Molecular Biology, University of Heidelberg, Heidelberg, Germany). HEK 293 cells were transfected using the calcium phosphate precipitation method (Chen and Okayama, 1987) with various combinations of pCDM8α1, pCIS2α6, pCDM8β3, pCDM8γ2S, and pCDM8δ. The expression of cDNAs cloned into the pCDM8 and pCIS2 vectors is under the control of the same promoter/enhancer system (Cytomegalo virus promoter). The following plasmid combinations were mixed: α1:β3:γ2, α1:β3, α1:β3:δ, α1:β3:γ2:δ, α1:β1:δ, α6:β3:γ2, α6:β3, α6:β3:δ, and α6:β3:γ2:δ (1 μg each construct). The coprecipitates were added to culture dishes containing 1.5 ml MEM medium for 12–16 hr at 37°C under 3% CO2. The media was removed, and the cells were rinsed twice with culture media and finally incubated in the same media for 24 hr at 37°C under 6% CO2. Cotransfection with the plasmid pGreenLantern (Life Technologies) encoding for a fluorescent protein allowed easy recognition of transfected cells expressing this fluorescent marker. More than 90% of the cells expressing the GreenLantern protein also expressed GABAAreceptors. Electrophysiological studies. Primary cultured granule cells or transfected HEK 293 cells were voltage-clamped at −50 mV in the whole-cell configuration using the patch-clamp technique (Hamill et al., 1981) on the stage of an Axioskop FS microscope equipped with Fluorescent and Nomarski optics (Zeiss) at room temperature. The recording pipette contained (in mm): 145 CsCl, 5 MgCl2, 11 EGTA, 5 NaATP, and 10 mm HEPES at pH 7.2 with CsOH. Cells were bathed in solution consisting of (in mm): 145 NaCl, 5 KCl, 2 CaCl2, and 5 HEPES at pH 7.2 with NaOH. Osmolarity was adjusted to 325 mOsm with sucrose. The culture dish in the recording chamber (<500 μl total volume) was perfused continuously (5 ml/min) to prevent accumulation of drugs. Electrodes were pulled in two stages on a vertical pipette puller from borosilicate glass capillaries (Wiretrol II, Drummond, Broomall, PA). Typical pipette resistance was 5–7 MΩ. Drug application. GABA responses in transfected HEK 293 cells and in primary cultures of cerebellar granule neurons were elicited by concentrations of GABA close to the EC20observed in dose–response studies from transfected cells with combinations of α, β, γ, and δ subunits (Ducic et al., 1995;Saxena and MacDonald, 1996). Because estimates of EC20 from these studies did not always match, we performed full dose–response studies in a few test cells for each cotransfection experiment to select the concentration producing 20% of the maximal response to GABA (our unpublished observations). Pregnenolone sulfate sodium salt (PS) (RBI, Natick, MA), 3α,-hydroxy-5α-pregnan-20-1 (3α-OH-DHP) (RBI), and 3α,21-dihydroxy-5α-pregnan-20-1 (THDOC) (RBI) were dissolved in bath solution containing dimethylsulfoxide at a maximal final concentration of 0.01%. Control solution containing 0.01% DMSO (Sigma) failed to modify GABA responses (data not shown). In studies with PS we used GABA at its EC50 concentration. Drugs were applied directly by a gravity-fed Y-tubing delivery system placed within 100 μm of the recorded cell. Drug application had fast onset (<5msec) and achieved a complete local concentration change of the recorded cell. In all experiments, neuroactive steroids were coapplied with GABA, with the exception of PS, which was additionally preperfused for 30 sec. Data acquisition and analysis. Currents were monitored with a patch amplifier (EPC-7; List Electronics, Darmstadt, Germany), filtered at 1.5 kHz (8-pole low-pass Bessel; Frequency Devices, Haverhill, MA), and digitized at 3.5 kHz with an IBM PC computer and the software Axotape 2 (Axon Instruments, Foster City, CA). Origin (MicroCal Software, Northampton, MA) was used for figure preparation and statistical analysis using Student’s t test withp < 0.01. The Bonferroni correction was applied for multiple-group comparison. Cellular RNA harvest and RT. Patch pipettes were filled with 8 μl of autoclaved intracellular solutions containing (in mm): 145 CsCl, 1 MgCl2, 5 EGTA, and 10 HEPES, to pH 7.2 with CsOH. The silver wire connected to the patch-clamp electrode was rechlorided electrochemically before recording from each neuron. At the end of a whole-cell patch recording, negative pressure was applied to the pipette, and the flow of the contents of the cell into the pipette tip was monitored under the microscope. The tip of the pipette containing the aspirated neuronal cytoplasm was broken in a test tube to expel its contents. To the 6.5 μl usually obtained in the test tube was added 3.5 μl of solution containing random hexamer primers, at a final concentration of 5 μm, the four deoxyribonucleoside triphosphates at a final concentration of 0.5 mm, dithiothreitol (final 5 mm), 100 U of Moloney murine leukemia virus RT (both from Life Technologies), and 20 U of ribonuclease inhibitor (Promega, Madison, WI). The resulting 10 μl mix was incubated for 1 hr at 37°C for the synthesis of single-stranded cDNA and kept at −80°C until amplification by PCR. PCR amplification of the GABAA γ and δ cDNA fragments. The first PCR reaction was performed in a final volume of 100 μl containing 50 pmol of each primer, the 10 μl RT reaction mixture, 200 μm (final concentration) of each deoxyribonucleotide, 1.5 mm MgCl2, 10 mm Tris-HCl, pH 8.3, 50 mm KCl (final concentration), and 2.5 U of Taq polymerase (Stratagene, La Jolla, CA). Thirty cycles (92°C, 40 sec; 55°C, 40 sec; 72°C, 60 sec) followed by 15 min of final extension at 72°C were performed. The second PCR reaction was performed in a final volume of 50 μl containing 1 μl of the primary PCR product, 10 pmol of each primer, and 50 μm of each deoxyribonucleotide, with a protocol similar to the first PCR reaction but using 35 cycles. Primers used to amplify γ sequences were 5′-AGGGATCCTGGGT(AG)TC(ACT)TT(CT)TGGATCAA [909–926] and 5′-GGCTCGAGCCA(AG)TA(AG)AC(AC)AG (AG)TTGAACA [1405–1424] during the first round of amplification, and nested primers 5′-AGGGATCCGT(CG)AC(AT)GC(AC)ATGGA(CT)CTCTT [1035–1054] and 5′-AACCTCGAGA(CT)CC(GT)(AG)G(AC)(AG)TAGGAG TC [1365–1377] for the second round of amplification. Amplification of δ sequence involved the primers 5′-AG GGATCCTGGTCAGAAAACCAGGAGCA [635–654] and 5′-AACCTCGAGATGTTGACTGCTGCAAAG [1354–1372] for the first round, and nested primers 5′-AAGGATCC AAATCAGCTGGCCAGTTCC [733–752] and 5′-AACCTCGAGACCTATAGGAACCCATGA [1209–1227] during the second round. Locations of primer sequences are indicated in brackets according to published sequences given in Shivers et al. (1989) or Zhao and Joho (1990). The first round of PCR included the first pairs of primers for γ and δ subunits. The second round of PCR included only one of the nested primer pairs in each reaction. Primers selected for γ subunits do not amplify genomic sequence, whereas those for the δ subunit are able to amplify genomic sequence that is easily distinguished from mRNA sequence based on the inclusion of one intron. In single-cell RT-PCR studies, a product derived from genomic sequence was never observed. Southern blot and restriction analysis. PCR products separated by agarose gel electrophoresis were transferred after alkaline denaturation to nylon membranes and immobilized by baking at 75°C in a vacuum oven. Oligonucleotide probes (100 ng) were end-labeled using T4 polynucleotide kinase and [γ-32P]-ATP. The membranes were submerged in 40 ml of 6× SSC (0.1 m NaCl/0.015 m sodium citrate, pH 7.6), 0.2% polyvinylpyrrolidone (w/v), 1% SDS. Radiolabeled probe was then placed in this buffer and allowed to hybridize at 37°C for 4 hr. The membranes were then washed four times for 5 min in 6× SSC, 0.1% SDS before being wrapped in cellophane and subjected to autoradiography. In addition to Southern analysis, characterization of γ subunit PCR products was performed using PstI,EcoRV, and BclI, which specifically differentiate γ1-, γ2-, and γ3-derived PCR products, respectively. Furthermore, restriction analysis for the long and short forms of γ2 subunit cDNAs was performed with EarI, which specifically cuts the long form of γ2L (Kofuji et al., 1991).PstI and BclI were from Stratagene, andEcoRV and EarI were from New England Biolabs (Beverly, MA). To determine the effect of δ subunit on GABAAreceptor sensitivity to THDOC, GABAA receptor subunit cDNAs (α6β3γ2, α6β3, α6β3δ, α6β3γ2δ) were transfected in HEK 293 cells, and responses were elicited by concentrations of GABA close to the EC20 observed in dose–response studies from transfected cells with combinations of α, β, γ, and δ subunits (see Materials and Methods). GABA was applied in the absence or presence of increasing neurosteroid concentrations, and induced Cl− currents in single, isolated HEK 293 cells were voltage-clamped at a holding potential of −50 mV using the patch-clamp technique (Fig. 1A). 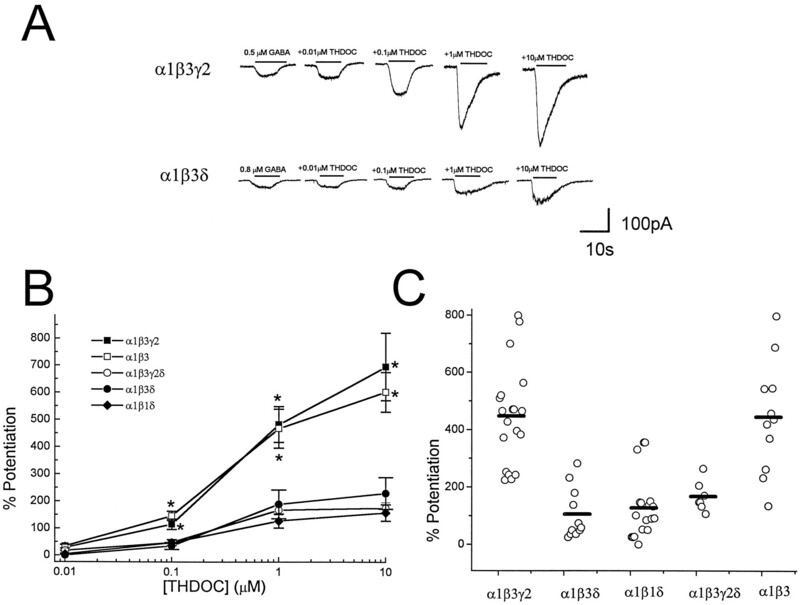 In cells cotransfected with α6, β3, and γ2 subunit cDNAs, THDOC clearly enhanced the GABA-activated currents, showing a concentration-dependent potentiation (Fig. 1B). The action of THDOC was also observed in recombinant GABAA receptors resulting from the α6β3 subunit cotransfection (Fig. 1B), and no significant difference in THDOC-induced potentiation was detected between α6β3γ2 and α6β3 subunit transfected cells; however, replacement of γ2 with δ subunits in the GABAA receptor subunit cotransfection dramatically reduced the GABAAreceptor sensitivity to THDOC potentiation. GABAA receptors in cerebellar granule neurons express combinations of α1, α6, β2/3, γ2, and δ subunits (for review, see Whiting et al., 1995;McKernan and Whiting, 1996). We therefore investigated the cotransfection of α6, β3, γ2, and δ subunit cDNAs in HEK 293 cells. The average potentiation of GABA-gated currents by THDOC was larger in α6β3γ2δ subunit cDNA transfection than in the α6β3δ transfection, but it was much less than that of cells transfected with the same subunit combinations lacking the δ subunit cDNAs (Fig. 1B). THDOC (1 μm) potentiation in individual cells transfected with α6β3γ2δ subunit cDNAs showed a rather broad variation, from a very low enhancement similar to that observed with the α6β3δ subunit transfection to a potentiation resembling that observed with α6β3γ2 or α6β3 subunit transfection (Fig. 1C). Effect of δ subunit expression on neurosteroid-induced modulation of GABA-gated currents in cells transfected with α6, β3, and γ2 subunit cDNAs. A, HEK cells were transfected with α6β3γ2 and α6β3δ subunit cDNAs, and currents were elicited by GABA in the absence or presence of THDOC. GABA or GABA + THDOC were applied by a Y-tubing system for the duration indicated by the bars. GABA-induced currents were recorded from isolated HEK 293 cells voltage-clamped at −50 mV.B, Potentiation was calculated by comparing current levels induced by coapplications of GABA + THDOC to GABA alone (0% potentiation). GABA concentrations were as follows: α6β3γ2, 0.05 μm; α6β3, 0.05 μm; α6β3γ2δ, 0.1 μm; and α6β3δ, 0.3 μm. Each point represents the mean ± SEM of the percent potentiation observed at each concentration studied in at least 10 cells.Asterisk indicates statistical significance (p < 0.01) when compared with the α6β3γ2 subunit cotransfection. C, Potentiation of GABA-activated currents induced by 1 μm THDOC for individual cells transfected with α6β3γ2, α6β3, α6β3γ2δ, or α6β3δ. Bars represent the mean values. In 14 cells transfected with combinations of the α6, β3, γ2, and δ subunit cDNAs, we compared the effect of increasing concentrations of another neurosteroid, 3α-OH-DHP, on GABA-activated Cl− currents. We observed a dramatically reduced potentiation, similar to the effects of THDOC, whenever the δ subunits were cotransfected (not shown). We also examined the α1 subunit cotransfected with combinations of β3 and γ2 and/or δ subunit cDNAs. Whole-cell currents were elicited by GABA concentrations at the EC20observed in transfected cells with combinations of α, β, γ, and δ subunits (see Materials and Methods). As shown in Fig.2A, cells transfected with α1, β3, and γ2 subunit cDNAs show very large enhancements of GABA-gated currents by the coapplication of THDOC in a concentration-dependent manner. The substitution of α1 with α6 subunit cDNA produced receptors endowed with a greater apparent potentiation by THDOC (Fig.2), consistent with a previous report (Puia et al., 1993). Similar to α6 subunit transfection, however, GABAA receptor sensitivity to THDOC was attenuated by substitution of γ2 with δ. The mean potentiations of GABA-gated currents by THDOC are summarized in Figure 2B, which shows a significant reduction of THDOC-induced potentiation whenever the δ subunit was transfected. 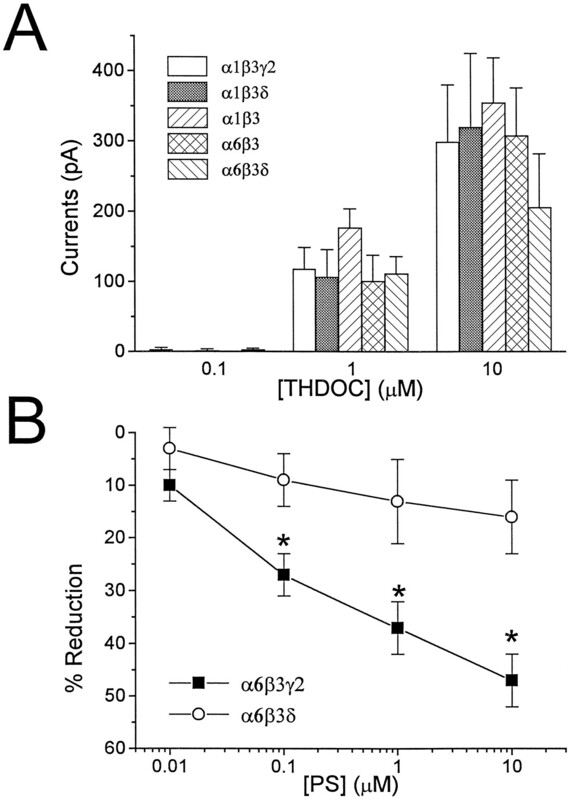 Our studies also demonstrate that omitting the γ2 subunit cDNA from the cotransfection mixture has no significant effect on THDOC-induced potentiation, but including the δ subunit cDNA in the α1β3γ2 transfection greatly decreases the THDOC-induced enhancement of GABAA-gated currents (Fig. 2B). Furthermore, no significant difference was found between the α1β3δ and α1β1δ transfection (Fig. 2B). Figure 2C shows the variability in potentiation of GABA responses in individual cells at one neurosteroid concentration (1 μm) after transfection with the various combinations of α1, β, γ2, and δ subunits. These data show that with a few exceptions, most cells within each cotransfection group exhibit a potentiation that is close to the average of all cells from that transfection experiment. These data suggest that the expression of δ subunits confers the functional distinction among the recombinant GABAA receptors. Effect of δ subunit expression on neurosteroid-induced modulation of GABA-gated currents in cells transfected with α1, β1, β3, and γ2 subunit cDNAs.A, HEK cells were transfected with α1β3γ2 and α1β3δ subunits, and currents were elicited by GABA in the absence or presence of THDOC. GABA or GABA + THDOC were applied by a Y-tubing system for the duration indicated by the bars. GABA-induced currents were recorded from isolated HEK 293 cells voltage-clamped at −50 mV. B, Potentiation was calculated by comparing current levels induced by coapplications of GABA + THDOC to GABA alone. GABA concentrations used were as follows: α1β3γ2, 0.5 μm; α1β3, 0.1 μm; α1β3γ2δ, 0.5 μm; α1β3δ, 0.8 μm; and α1β1δ, 1 μm. Each point represents the mean ± SEM of the percent potentiation observed at each concentration in at least 12 cells. Asteriskindicates statistical significance (p < 0.01) when compared with the α1β3δ subunit cotransfection.C, Potentiation of GABA-activated currents induced by 1 μm THDOC for individual cells transfected with α1β3γ2, α1β1δ, α1β3, α1β3γ2δ, or α1β3δ. Bars represent the mean values. It has been shown previously that THDOC directly activated recombinant GABAA receptors and that this action was blocked by GABAA receptor antagonists (Puia et al., 1990). Figure 3A shows the extent of direct activation of recombinant GABAA receptors obtained in cells transfected with the various combinations of α1, α6, β3, γ2, and δ subunit cDNAs. We failed to observe significant differences among distinct subunit combinations (Fig. 3A). In most experiments, THDOC combined with GABA was then tested to evaluate the extent of potentiation by the neurosteroid in that particular cell. In cells transfected with cDNAs for δ subunits, the extent of potentiation was equal to or less than the sum of the direct activation of Cl− channels by GABA and THDOC. For example, the ratios between the response to THDOC (10 μm) combined with GABA and the sum of the direct activation by GABA (at the EC20concentration) and THDOC (10 μm) applied independently were 0.9 ± 0.1 for the α1β3δ and 1.0 ± 0.2 for the α6β3δ transfection (mean ± SEM; n = 8). In contrast, whenever the cDNA for the δ subunit was omitted, these ratios were 2.5 ± 0.6 for α1β3γ2, 2.0 ± 0.2 for α1β3, and 2.0 ± 0.3 for α6β3 transfections (mean ± SEM; n = 9). Neurosteroid actions on GABAA receptor in transfected HEK 293 cells. A, THDOC-induced direct activation of GABAA receptors in transfected HEK 293 cell. HEK 293 cells were cotransfected with a combination of α1β3γ2, α1β3δ, α1β3, α6β3, or α6β3δ subunit cDNAs. The peaks of the Cl− currents obtained at a holding potential of −50 mV by Y-tubing application of THDOC at three distinct concentrations are shown as mean ± SEM. Data were obtained in at least 10 transfected cells per each combination studied. No statistical significance was observed when data at each concentration were compared for distinct cDNA transfections. B, PS-induced modulation of GABA-gated currents in transfected HEK 293 cells. Currents were evoked by a GABA concentration close to the EC50 reported for each particular combination. The coapplication of the indicated PS concentrations with GABA in HEK cells transfected with α6β3γ2 or α6β3δ reduced the GABA-gated currents in a concentration-dependent manner. Reduction was calculated by comparing the current level induced by applications of PS + GABA to GABA alone (0% reduction). Each point represents the mean ± SEM of the percent reduction measured in at least 12 cells.Asterisk indicates statistical significance (p < 0.01) when compared with the α6β3δ subunit cotransfection. In addition to positive modulation by neurosteroids, we wanted to test the effects of PS, a negative modulator of GABAAreceptors (Majewska, 1988). In these experiments we used GABA concentrations close to those producing a half-maximal response. Figure3B shows the comparison between the effect of PS on GABA-elicited currents in HEK 293 cells transfected with α6β3γ2 versus α6β3δ subunit cDNAs. The replacement of the γ2 subunit with the δ subunit cDNA in the transfection mixture significantly reduced PS-induced inhibition of GABA-gated currents in HEK 293 cells. To test neuroactive steroid-induced modulation of GABA-gated currents in native receptors comprising the δ subunit, we investigated the potentiation by THDOC using patch-clamp recordings from rat cerebellar granule neurons in primary culture. GABA-activated currents were elicited at their EC20 concentrations (Zheng et al., 1995) from single granule neurons at 4 or 14 d in vitro (DIV) at the holding potential of −50 mV (Fig.4A). As shown in Figure4A, coapplication of 10 nm THDOC has little effect on GABA-gated currents, whereas a large enhancement was found by coapplication of 1 μm THDOC, showing the concentration-dependence of the potentiation. 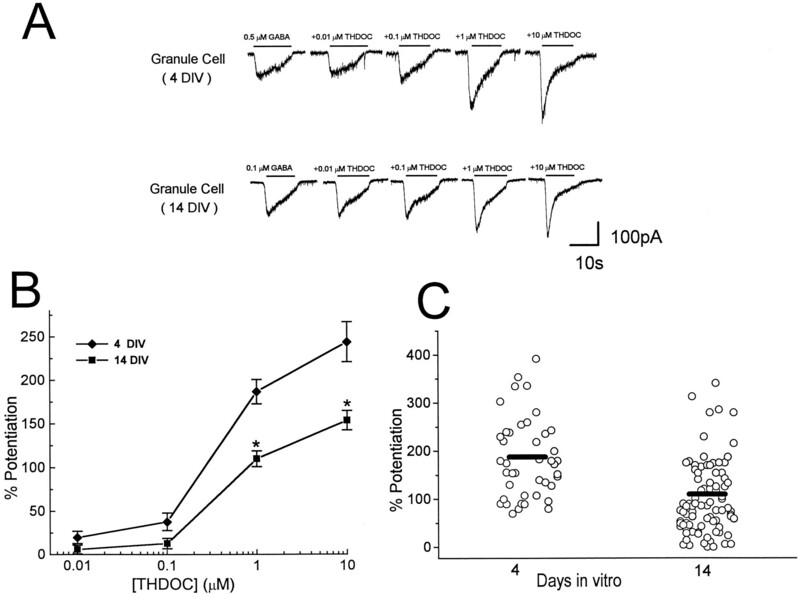 The extent of potentiation was significantly lower in 14 DIV granule cells than at 4 DIV (Fig. 4B). A summary of results obtained with THDOC potentiation of GABA-gated currents from individual neurons at different times in culture is shown in Figure 4C, indicating that neurosteroid potentiation was highly variable from cell to cell but that GABAA receptors assembled in older cells often have a lower sensitivity to the neuroactive steroid. In vitro development decreases neurosteroid-induced modulation of GABA-gated currents in cerebellar granule cells. A, GABA-induced currents in the absence or presence of THDOC recorded from cultured cerebellar granule cells at 4 or 14 DIV voltage-clamped at −50 mV. GABA or GABA + THDOC were applied by a Y-tubing system for the duration indicated by thebars. B, THDOC dose–responses in cerebellar granule cells at 4 and 14 DIV. Potentiation was calculated by comparing current levels induced by coapplications of GABA and THDOC to GABA alone. Each point represents the mean ± SEM of the potentiation obtained in at least 15 cells. Asteriskindicates statistical significance (p < 0.01) when compared with 14 DIV cells. C, Potentiation of GABA-activated currents induced by 1 μm THDOC for individual cells at 4 and 14 DIV. Bars indicate the average values. A previous report (Puia et al., 1993) and our results described above suggest that neurosteroid potentiation is diminished when cells are transfected with α6 versus α1 subunit cDNA. Therefore the developmental increase of the α6 subunit expression in cerebellar granule neurons in culture (Laurie et al., 1992a,b; Zheng et al., 1993,1995; Mathews et al., 1994) could be an important determinant in the change of neurosteroid modulation during development. On the other hand, our recombinant cDNA studies indicated that the δ subunit is another important determinant in the inhibition of the allosteric modulation of GABAA receptors in HEK 293 cells. Therefore, we decided to study the correlation between the presence of GABAA receptor δ subunit mRNA in cerebellar granule neurons and THDOC-induced potentiation of GABA-gated currents. For comparison, we also examined the presence or the absence of γ subunit mRNA. 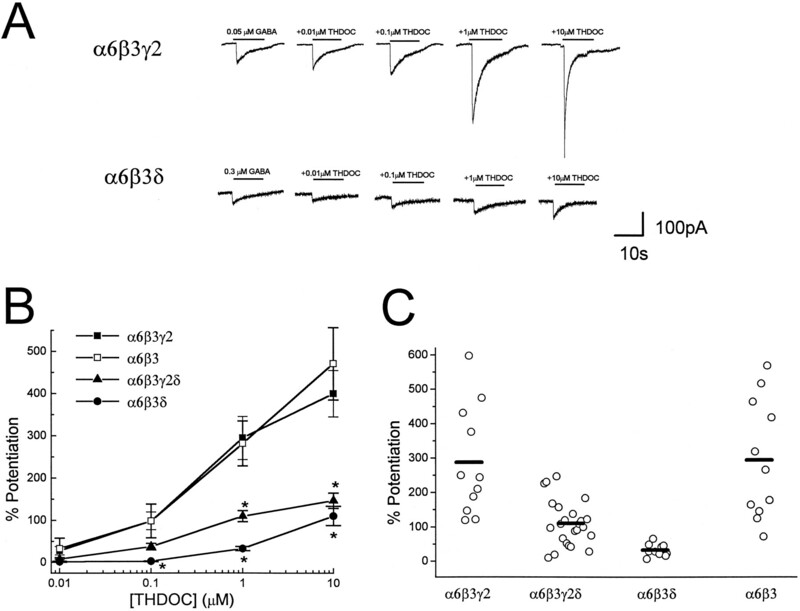 The δ and γ subunit mRNAs in single, cerebellar granule neurons were detected using single-cell RT-PCR, and the THDOC-induced potentiation of GABA currents was measured by patch-clamp technique. Cerebellar granule neurons were identified according to their morphological characteristics. Cells were clamped at −50 mV, and GABA-activated currents were recorded in the absence or presence of THDOC. After a complete dose–response with THDOC was obtained, the cell content was harvested by application of negative pressure in the pipette to be processed for RT-PCR of γ and δ subunit mRNAs. For each PCR experiment, controls were performed to verify the absence of contaminating mRNA. Shown in Figure 5 are controls in which whole-cell recording was not performed, but a small amount of medium was removed from the bath in the presence of the cerebellar culture. Other negative controls included RT-PCR subjected to all reaction components (without the addition of cellular cytoplasm) and removal of cytoplasm without RT. All results from a set of PCR reactions were discarded when control samples yielded PCR products. Data presented here were limited to cells in which either γ or δ subunit mRNAs or both were detected, typically >75% of the cells investigated. We observed granule cells expressing both γ and δ mRNAs, as well as cells in which the exclusive presence of γ or δ mRNAs was detected (Fig. 5). The identity of the γ subunit subtype was characterized further in all cases with the use of specific restriction enzymes. The γ2 subunit was exclusively found in >90% of all cells expressing γ subunit mRNA, and only these cells were considered. In all cells in which γ2 subunit mRNA was detected, further restriction analysis revealed the presence of the short form of the γ2 message. The correct correspondence of the PCR product was confirmed by Southern Blot analysis (Fig. 5B). In a total of 27 granule cells at 14 DIV, 23 were positive for γ2 subunits (85%) and 14 were positive for δ subunits (52%). At 4 DIV, all 13 cells were γ2-positive, and none was positive for δ subunits. In one cell at 4 DIV and in five cells at 14 DIV, the long form of the γ2 message was also found. Single-cell RT-PCR analysis in cultured cerebellar granule cells. Granule cells from 4 DIV (A) or 14 DIV (B) cultures were analyzed by single-cell RT-PCR as described in Materials and Methods. A andB show three representative cells from each culture. For each PCR experiment, controls were performed to verify the absence of contaminating cDNA. Shown here are controls (Co) in which whole-cell recording was not performed, but a small amount of medium was removed from the bath solution with the patch pipette.B, Bottom panels show Southern blot analyses of the corresponding PCR products using radiolabeled γ2-specific primer 5′-AGCAACCGGAAACCAAGCAAGGATAAAGAC, which was then stripped and the membrane was rehybridized with the δ-specific primer 5′-TCAATGCTGACTACAGGAAGAAACGGAAAG. C shows the potentiation of GABA-activated currents induced by 1 μmTHDOC for individual cells at 14 DIV in which RT-PCR of the individual cells indicated the presence of γ and/or δ subunit mRNA as indicated. Mean potentiations of cells in which the presence of δ and γ/δ subunit mRNA were detected were statistically lower (p < 0.01) than that for cells in which only the γ subunit mRNA was found. The average THDOC (1 μm) potentiation of GABA-gated current at 4 DIV was 216 ± 26%, whereas at 14 DIV it was 132 ± 19%. Cells expressing δ subunit mRNA or to a lesser extent those expressing both γ2 and δ subunit mRNAs showed a reduced enhancement of GABA-gated currents by THDOC (Fig.5C). In cells at 14 DIV, THDOC (1 μm) potentiation of GABA-gated currents in cells expressing exclusively the γ2 subunit mRNA was 197 ± 25% (n = 13). In contrast, cells expressing exclusively the δ subunit mRNA exhibited a potentiation of 42 ± 15% (n = 4); in those cells expressing the γ2 and δ subunit mRNAs, the potentiation was 95 ± 22% (n = 10). In cells expressing the γ2L message, the extent of potentiation observed was not significantly different from that in those cells in which only the short form of γ2 was detected (data not shown). Recombinant cDNA studies showed that neurosteroids enhance GABAA receptor function assembled from various receptor subunits, including homo-oligomeric receptors, but the potency and efficacy of neurosteroid modulation were found to vary to some extent with subunit composition (Lan et al., 1991; Shingai et al., 1991; Puia et al., 1993). Our data show for the first time that cotransfection of α1β3 or α6β3 subunits with δ but not γ subunit cDNAs profoundly alters neurosteroid modulation of GABAA receptor channels. These findings add to the distinct pharmacological characteristics of GABAA receptors containing δ subunits, including EC50s of GABA dose–response, allosteric modulations by benzodiazepines and barbiturates, and lanthanum-induced potentiation (Saxena and MacDonald, 1994, 1996; Ducic et al., 1995). We investigated both direct and potentiating effects of neurosteroids on GABAA receptors. In cells cotransfected with δ subunit cDNA, neurosteroid potentiation is considerably lower than in parallel transfected cells lacking the δ subunit cotransfection; however, direct activation of GABA-gated currents was observed at THDOC concentrations ≥1 μm, as is characteristic of cells transfected with different GABAA receptor subunit cDNA combinations. As a consequence, in δ subunit cotransfected cells, the amplitude of currents elicited by the combination of THDOC and GABA was equal to or less than the sum of amplitudes of the currents observed by GABA and THDOC applied independently. We thus propose that the presence of the δ subunit in the GABAA receptor assembly produces receptors that lack neurosteroid modulation but can be activated directly by neurosteroids. Our results on the inhibition of THDOC modulation by the δ subunit cotransfection are supported further by similar findings obtained with 3α-OH-DHP and PS, a neurosteroid acting as a negative modulator. The presence or absence of the γ2 subunit, as well as substitution of the α or β subunit, failed to alter the effects of δ subunit cotransfection on neurosteroid modulation. Several reports present data demonstrating distinct ligand binding and steroid-induced allosteric modulation of GABAA receptors in various brain regions (Gee et al., 1988; Gee and Lan, 1991; Sapp et al., 1992). Indeed, in situ hybridization studies demonstrated a selective abundance of the mRNAs encoding the δ subunit in the granule neurons of the mammalian cerebellum and hippocampus (Laurie et al., 1992b), areas in which distinct effects of neuroactive steroids have been reported (Sapp et al., 1992; Cooper et al., 1995). In our transfection experiments, we observed a large variability of the neurosteroid potentiation, even when only two subunit cDNAs were used. The reasons underlying this observation are not easily interpreted, but they may relate to the complex interactions between direct receptor activation and allosteric modulation by neurosteroids combined with variable receptor numbers from cell to cell and other factors such as unknown subunit stoichiometry. The reduced variability, however, of the neurosteroid potentiation observed in our transfection experiments indicates that αβ3δ or αβ3γ2δ, and not αβ3 or αβ3γ2, are likely to be the dominant isoforms in the GABAA receptor assembly in cells transfected with αβ3δ or αβ3γ2δ cDNAs, in congruence with a previous report (Saxena and MacDonald, 1994). Also in agreement with a previous report (Puia et al., 1993), we found that recombinant GABAAreceptors are apparently less sensitive to THDOC-induced allosteric modulation when transfecting with α6 versus α1 subunit cDNA. We also confirm that the replacement of different β subunits has no effect on the modulatory activity of THDOC and that there is no absolute requirement for the presence of the γ subunit to observe neurosteroid potentiation (Puia et al., 1990, 1993). Our results are therefore consistent with the proposal that steroid potency and efficacy may be dependent on the cooperation of subunits that are assembled to form the GABAA receptor (Lambert et al., 1995). In our study, we used GABA at the EC20 derived from dose–response studies in transfected cells with combinations of α, β, γ, and δ subunits (Ducic et al., 1995; Saxena and MacDonald, 1996; our unpublished observations). For the most part, these observations matched those of different studies; however, there were a few notable differences. Among them, the most striking is the considerable response we observed with α6β3 subunit heteromers, in contrast to the lack of GABA-activated current found by Saxena and MacDonald (1996) in cells transfected with this subunit combination. At present we do not know the reason underlying these results, although it is possible that the different types of cells used to expressed recombinant GABAA receptor may contribute to some of these differences. In any case, our direct estimate of the GABAAreceptor EC20 in each subunit cotransfection setting had to be used for the study of neurosteroid modulation. GABAA receptor sensitivity to neurosteroids is markedly decreased with development in a subset of cerebellar granule neurons in culture. A decreased modulation by neurosteroids at 14 DIV might be accounted for partly by the developmental increase of the α6 subunit mRNA expression (Laurie et al., 1992a,b; Zheng et al., 1993,1995; Mathews et al., 1994). Our results demonstrate that cotransfection of δ with both α6β3 and α6β3γ2 subunit cDNAs significantly reduces the THDOC-induced potentiation, indicating a determinant role of δ subunit in the assembly of neurosteroid-insensitive GABAA receptor. As a consequence, we addressed the role of δ subunit expression in neurosteroid modulation of native receptors by using whole-cell recordings combined with single-cell RT-PCR analysis. The δ subunit is present predominantly in granule neurons of cerebellum and hippocampus (Benke et al., 1991; Laurie et al., 1992a), where it colocalizes with α1, α6, β2/3, and γ2 subunits in the cerebellum and with α1, α4, β2/3, and γ2L subunits in hippocampus (Laurie et al., 1992a,b;Quirk et al., 1994, 1995). In the cerebellum, δ subunit mRNA and protein levels increase with development (Bovolin et al., 1991; Laurie et al., 1992a,b; Fritschy et al., 1994). The results of our single-cell RT-PCR study are in agreement with previous studies on developmental expression of δ subunit mRNAs in cultured cerebellar granule cells (Zheng et al., 1995; Behringer et al., 1996). Although the mRNA for the δ subunit was found in a limited number of neurons at 14 DIV, its presence in specific cells correlates well with a decreased sensitivity of GABAA receptors to neurosteroid modulation. Because we limited our analysis to the expression of the γ2 and δ subunits, we cannot rule out that distinct α, β, or γ subunits may also affect GABAA receptor sensitivity to neurosteroids to some extent. It is clear from our results, however, that the positive identification of the δ subunit mRNA by single-cell RT-PCR correlates closely with lowered neurosteroid responsiveness. Taken together, our data show that a reduced sensitivity of native GABAA receptor to neurosteroids during the development of granule neurons in culture is related, at least in part, to the developmental increase of δ subunit expression. Similar findings, i.e., a reduced effect of neurosteroids, were reported for GABAA receptors involved in inhibitory synaptic currents recorded in hippocampal granule neurons in developing rat brain slices (Cooper et al., 1995). Thus, a structural requirement for the allosteric regulation of GABAA receptor function by neurosteroids may have important physiological significance for fast inhibitory neurotransmission. This work was supported by National Institute of Neurological Disorders and Stroke Grants R01 NS32759 and K04 NS01680. We are grateful to Dr. Dennis R. Grayson for critical reading of the manuscript. GABAA receptor subunit expression vectors were kindly provided by Dr. Peter H. Seeburg, Center for Molecular Biology, University of Heidelberg, Heidelberg, Germany. (1996) Differential regulation of GABAA receptor subunit mRNA in rat cerebellar granule neurons: importance of environmental cues. J Neurochem 66:1347–1353. (1991) Identification and immunohistochemical mapping of GABAA receptor subtypes containing the δ subunit in rat brain. FEBS Lett 283:145–149. (1991) Distinct developmental patterns of expression of rat α1, α5, γ2S, and γ2L γ-aminobutyric acidA receptor subunit mRNAs in vivo and in vitro. J Neurochem 59:62–72. 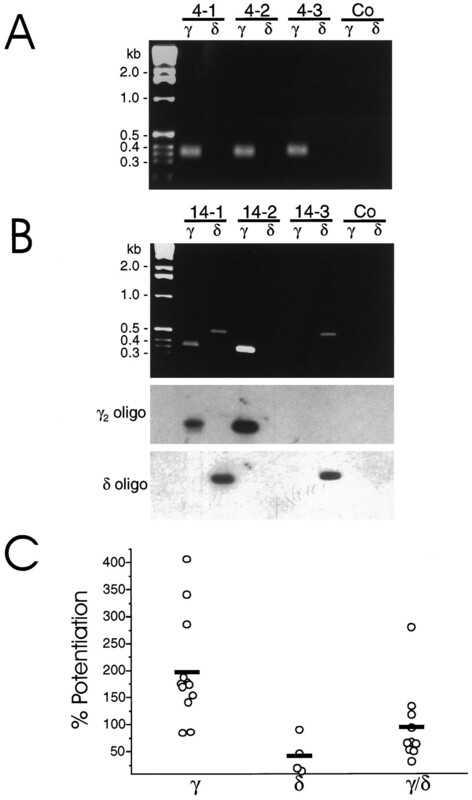 (1987) High-efficiency transformation of mammalian cells by plasmid DNA. Mol Cell Biol 7:2745–2752. (1995) Differential sensitivity of synaptic GABAergic currents to a neuroactive steroid in brain slices from male rats. Soc Neurosci Abstr 21:1345. (1995) γ-aminobutyric acid gating of Cl− channels in recombinant GABAA receptors. J Pharmacol Exp Ther 272:438–445. (1995) GABAA receptor heterogeneity in the adult rat brain: differential regional and cellular distribution of seven major subunits. J Comp Neurol 359:154–194. (1994) Switch in the expression of rat GABAA receptor subtypes during postnatal development: an immunohistochemical study. J Neurosci 14:5302–5324. (1991) γ-Aminobutyric acidA receptor complexes in rat cortex and spinal cord show differential responses to steroid modulation. Mol Pharmacol 40:995–999. (1988) Steroid modulation of the chloride ionophore in rat brain: structure-activity requirements, regional dependence and mechanism of action. J Pharmacol Exp Ther 246:803–812. (1981) Improved patch-clamp technique for high-resolution current recording from cell and cell-free membrane patches. Pflügers Arch 391:85–91. (1991) Generation of two forms of the gamma-aminobutyric acid A receptor γ2 subunit in mice by alternative splicing. J Neurochem 56:713–715. (1993) Regional γ-Aminobutyric acid sensitivity of t-butylbicyclophosphoro[35S]thionate binding depends on γ-aminobutyric acidA receptor a subunit. Mol Pharmacol 44:87–92. (1995) Neurosteroids and GABAA receptor function. Trends Pharmacol 16:295–303. (1991) Differential responses of expressed recombinant human γ-aminobutyric acidA receptors to neurosteroids. J Neurochem 57:1818–1821. (1992b) The distribution of 13 GABAA receptor subunit mRNAs in the rat brain. III. Embryonic and postnatal development. J Neurosci 12:4151–4172. (1988) Neurosteroid pregnenolone sulfate antagonizes electrophysiological responses to GABA in neurons. Neurosci Lett 90:279–284. (1994) Developmental alteration in GABAA receptor structure and physiological properties in cultured cerebellar granule neurons. Neuron 13:149–158. (1996) Which GABAA receptor subtypes really occur in the brain. Trends Neurosci 19:139–143. (1989) Importance of a novel GABAA receptor subunit for benzodiazepine pharmacology. Nature 338:582–584. (1990) Neurosteroids act on recombinant human GABAA receptor. Neuron 4:759–765. (1993) Does neurosteroid modulatory efficacy depend on GABAA receptor subunit composition? Receptors Channels 1:135–142. (1994) Model of subunit composition of γ-aminobutyric acid receptor subtypes expressed in rat cerebellum with respect to their α and γ/δ subunits. J Biol Chem 269:16020–16028. (1995) Characterisation of δ-subunit containing GABAA receptors from rat brain. Eur J Pharmacol 290:175–181. (1992) Regional variation in steroid anesthetic modulation of [35S]TBPS binding to γ-aminobutyric acidA receptors in rat brain. J Pharmacol Exp Ther 262:801–806. (1994) Assembly of GABAA receptor subunit: role of the δ subunit. J Neurosci 14:7077–7086. (1996) Properties of putative cerebellar γ-aminobutyric acid (A) receptor isoforms. Mol Pharmacol 49:567–579. (1991) Effects of subunit types of cloned GABAA receptor on the response on the response to a steroid. Eur J Pharmacol 206:77–88. (1989) Two novel GABAA receptor subunits exist in distinct neuronal sub-populations. Neuron 3:327–337. (1990) The effect of subunit composition of rat brain GABAA receptors on channel function. Neuron 5:703–711. (1989) Steroid anesthetics and naturally occurring analogs modulate the γ-aminobutyric acid receptor complex at a site distinct from barbiturates. J Pharmacol Exp Ther 248:960–966. (1995) Structure and pharmacology of vertebrate GABAA receptor subtypes. Int Rev Neurobiol 38:95–139. (1990) Isolation of distantly related members in a multigene family using the polymerase chain reaction technique. Biochem Biophys Res Commun 167:174–182. (1995) Changes in γ-aminobutyrate type A receptor subunits mRNAs, translation product expression, and receptor function during neuronal maturation in vitro. Proc Natl Acad Sci USA 91:10952–10956.